ST. PETERSBURG, Russia (AP) A beaming French president. A bummed Belgian king. A goalkeeper seemingly suspended in the air. Two of the World Cup’s most potent attacking teams produced just one goal but a bounty of unforgettable images when France and Belgium met in Tuesday’s semifinal in St. Petersburg. 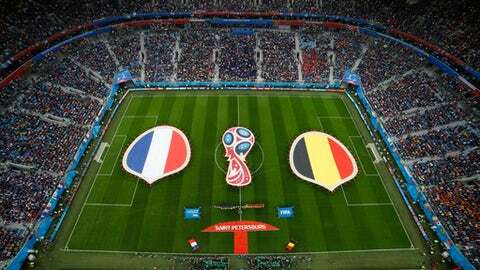 For the first 30 minutes or so it was all Belgium, the tournament’s most prolific scoring team, with French defenders desperately challenging them. It looked for an instant like the Belgians had broken through when Toby Alderweireld turned and snapped a shot toward the French net from close range. Just as suddenly, goalkeeper Hugo Lloris was horizontal, photos freezing him seemingly floating off the ground in mid-save. His Belgian counterpart, Thibaut Courtois, nearly matched him, sticking out a foot to thwart an out-of-nowhere French chance. Ultimately, it was Samuel Umtiti rising above everyone else to steer a header past Courtois and the French back to the World Cup final.